Adsense and AdWords – why use them? The post Adsense and AdWords – why use them? appeared first on SitePoint. https://www.primarytech.com/wp-content/uploads/2013/04/PrimaryTechnologies-Logo-new1-300x144.png 0 0 admin https://www.primarytech.com/wp-content/uploads/2013/04/PrimaryTechnologies-Logo-new1-300x144.png admin2018-08-31 22:00:022018-08-31 22:00:02Adsense and AdWords – why use them? Some interesting distortion effects and a dynamic design. Our pick this week. ?Hotjar is everything your team needs to get ‘in-the-moment’ visual feedback and better understand how people are really using your site. Michelle Barker shows how to use CSS Grid with variables at a component level. A tutorial on how to code a nice recreation of a Mondrian-like art piece. By Tim Holman. A great talk by Greg Whitworth at CSS Day 2018. An experimental WebGL cyberpunk 3D music clip made by Martin Laxenaire. An article by Jeremy Wagner and Addy Osmani where you can learn all about how code splitting can help with your site’s performance. A beautiful handwritten brush font by WildOnes Design. 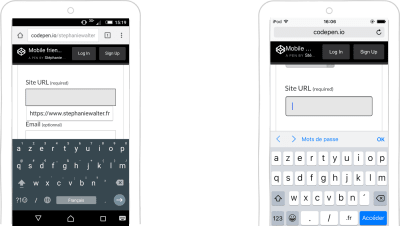 Dion Almaer writes about why it makes sense to start with a PWA experience for your new idea. Jamie Kyle’s modified MIT license that excludes certain companies. A wonderful article on the beauty and importance of generative art. By Jason Bailey. In case you didn’t know about it yet: RSSHub is a lightweight and extensible RSS feed aggregator that can generate feeds from pretty much anything. A renderless rich-text editor for Vue.js based on Prosemirror. In case you didn’t see them yet: All web graphic experiments by Keita Yamada in one place. These instruments you can play with other people on the web. By Sara Viera. Ricardo Prieto shows how to make a CSS-powered form with progressive disclosure. 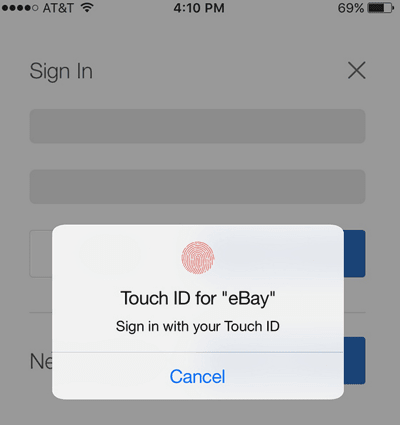 Nick Babich offers useful advice for better mobile form design. Sebastiano Guerriero shows how to set a spacing system in CSS, and how to take advantage of relative units to handle responsiveness. Some helpful advice on making the best use of Git. By Aditya Sridhar. Collective #446 was written by Pedro Botelho and published on Codrops. It might feel odd for some that I would go about explaining how to launch a $100 store and start with the product but truth is, the site, domain, logo everything needs to be tailored to fit the product you are trying to sell. The success or failure of your business will rely on your ability to select the correct product and the right market so don’t skip over this step. Here’s a quick way to validate your idea: Go to Google Trends and type in a word that describes your product, eg: “phone case” or “headlights”. You’ll see in a graph below how much interest there is in a particular region like the US. Keep in mind you can also see the results of Worldwide searches but if you are going to target a particular region I’d advise you look there. Look for trends going up or have a steady above 40 interest. That’s what you are looking for. A couple of years ago I launched a business selling baby and toddler related toys, clothes, etc. 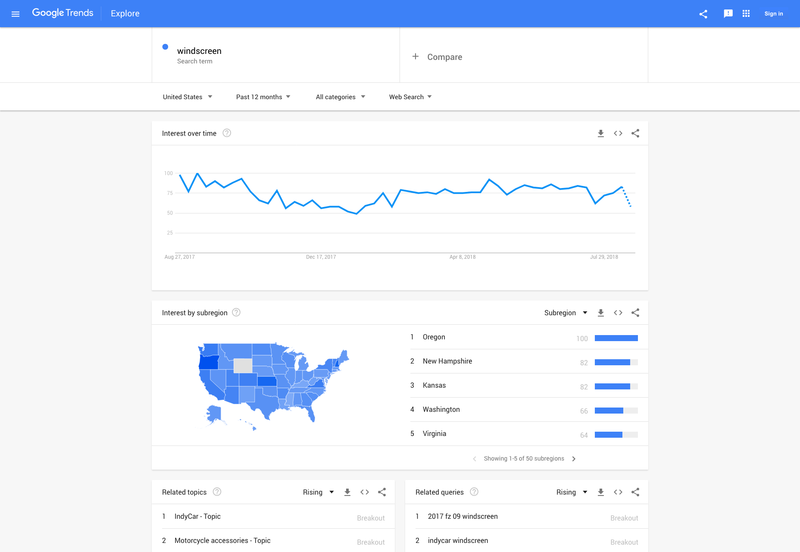 When I looked at Google Trends I remember doing around 40 different searches and seeing what my audience was looking for to get a proper understanding of what my target audience looks for and what types of products I need to add to the store. A second, yet just as important step here is to look for what your competition does, how they address their customers and look for negative feedback from their users. See what they do wrong and aim to improve on those aspects specifically. So you found your product and market. Good for you. Now you need to get the domain that will bring in your flock of loyal customers and though it might sound irrelevant, the domain can really hurt you if you don’t get the right one. So what makes a good domain name? Good question. It’s hard to decide if you want to get something brandable or get some keywords in the domain name. If you end up using keywords in the domain name you’d give your viewers a clear idea of they’ll be getting when seeing your store but what if you want to pivot? What if you find out 6 months in, that the store is selling more than just whatever your keyword in the domain is. If your aim is to build a strong brand, then by all means, put your brand name in the domain. In regards to the TLD (Top-level domain) you choose, get a “.com” if your audience is worldwide, and go local if you are targeting a specific country. It’s as simple as that. Other than that, keep your domain name short, be unique and unless you have no other choice, avoid hyphens. As far as providers go I usually stick to Godaddy.com or namecheap.com, both are great services with good service and solid support. I could probably talk for the next hour on why you should pick one CMS or another, why you can go serverless or use a traditional hosting or even if you should go for a SaaS option or not, but I won’t go into that much detail. Instead, I’ll touch briefly on each subject and only talk about the main “players” in each category. We’ve seen, the past few years, an explosion of E-commerce SaaS options, some better than others yet the fact that almost every week you hear about a new SaaS in this segment makes me think there’s still room for innovation. What are the benefits of having a SaaS? Basically, you get to launch your store exponentially faster. You basically signup, add your products, set up payments and delivery options and you are good to go. Before I get swarmed by angry mobs yelling at me for not talking about their favorite e-commerce platform provider, I want to point out that I’ll limit this article to only two SaaS platforms, that I think, are different enough to give you a wider perspective on how far you can actually go choosing an e-commerce SaaS. Number 1: the king of e-commerce SaaS: Shopify, an easy to use platform that will make sense for most people needing a simple shop with no need for a whole lot of customization. There’s a ton of support for it, themes, plugins and customizing your shop is really easy. Number 2: a newer player in the SaaS space, yet special: Blugento, a simple to use SaaS, similar to Shopify in this regards, the difference being that behind the curtains, there a fully functioning Magento platform doing the heavy lifting. (I’ll talk about Magento as a self-hosted platform below.) The main benefit of Blugento is the scalability of the store, something lacking from all other providers and an aspect that’s incredibly important. 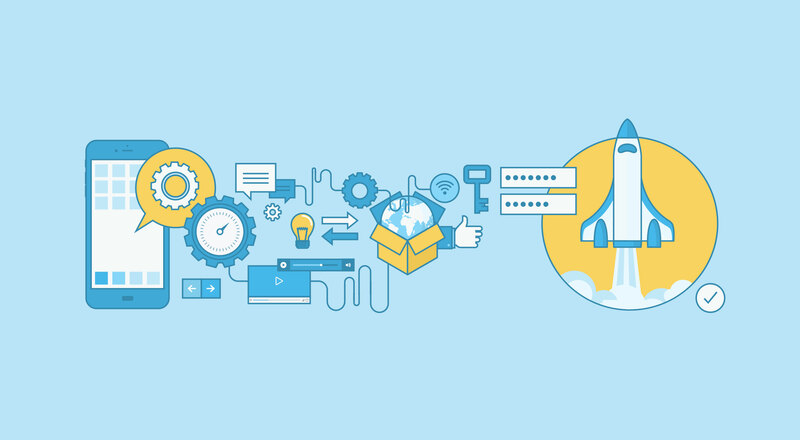 Self-hosted solutions are dime a dozen and they differ from one another by a number of differences but perhaps the most important one is the community surrounding it. This is a crucial factor for you and your store. Since you are reading a “$100 e-commerce site” article you probably can’t rely on a big team of in-house developers that you can breed, educate, and have lying around until that inevitable time when your site will go down. …that’s why I’m going to only talk about the two biggest platforms, Magento and WooCommerce. They are both immensely popular with crazy big communities around them, testing, developing and pushing the platform to the limits. Number 1: Magento has been around since 2008 and it quickly became a favorite amongst developers even if, at the time, there were bigger and more popular e-commerce CMS. Magento is not going to be for everyone, hosting costs are going to be higher, development is more complicated but in return, you get a versatile store with a lot of room for customization and it scales gracefully so when your business grows, your store can grow with it handling hundreds of thousands of products without a problem. Number 2: WooCommerce is on the other side of the spectrum, easy to install, development is easy and you get a ton of free plugins and themes. Since it runs on top of WordPress development is cheap and it’s relatively easy to find developers to work on the store adding extra features. Compared to Magento, the management of inventory and orders is faster and easier but after about 50K products added to your store, you’ll have to think about upgrading to something like Magento. Both self-hosted options described above will need a hosting company before they can see the light of day. I personally recommend going with hostgator.com or siteground.com but there are a ton of great choices out there. Installing either platform is easy as both hosting providers offer tools for installing Magento or WordPress through a simple point and click wizard. No more messing with the console, creating databases and editing confusing PHP files. I’d be remiss not to mention serverless in this discussion as this is something that has been talked a lot about in the recent months and we’ve seen big names in E-commerce move their operations to the cloud, companies like Zalora. Zalora moved everything to AWS, website, mobile apps, warehouse operations, everything is running off of EC2, S3, Lambda, and RedShift. They are the biggest retailer in Asia with over 20 million users and yet, their entire infrastructure development team is composed of 3 people, which for anyone understanding the difficulties running such a large website can say it’s amazing! This is done through AWS Lambda, a service launched by Amazon that lets you upload small pieces of code that work as microservices, called functions—hence the term Functions as a Service or FaaS. They basically do a very specific task that your website triggers, returning a simple result. The technology behind it promises to allow developers to build websites and apps without having to worry about the backend or the infrastructure, all while keeping the costs at an all-time low. There are three big reasons for switching to a serverless framework: cost, development speed and scalability. There are companies saving tens of thousands of dollars a month after switching to serverless and an average of 77% faster delivery speed of the products. Check out this case study on how serverless saves money in comparison to traditional hosting solutions. If I’d were to say branding is important I’d be grossly understating it. I will say that a solid logo and branding will make up the foundation of your successful store. So how can you build one that reflects your company’s image while still looking professional? Well, the easy way would be to throw money at it, but we don’t roll like that, so we’ll be doing this ourselves. The first place to start is to look for inspiration and you do this by going through design and branding websites looking at the current trends, tutorials and any tips or tricks that will help you in this endeavor. My suggestion would be to start with sites like hipsthetic.com or designoholic.com and then try to expand your search to Pinterest. Alright, you now have an idea of what you need but you aren’t going to pay a couple of hundred dollars per month for Photoshop because that will blow the entire budget we’ve set for ourselves. So what we do is we sign up with Canva.com. It’s free and it will get you started quite fast. After watching a 1-minute tutorial you’ll be ready to start creating your first logo. Don’t stop at one. Make two or three and show them to a couple of friends to get feedback. After picking the winner get back to Canva.com and make a few more: one that has transparency; one that is all black; and one that is all white. You can use the color one for your website and the rest you’ll use to watermark catalog images (I don’t really recommend using watermarks on product images but if you absolutely have to, place them in a corner somewhere) business cards, social media posts, etc. You get the point. Alright, we almost made it. There’s only one little step ahead of us. And by little I actually mean the most important thing you’ll end up doing for your business. Let’s start with something basic: on page SEO, sounds easy enough, right? Well, not exactly. There are a lot of moving parts when it comes to SEO and I won’t have time to go into much detail but I will let you with this awesome infographic that will teach you pretty much all you need. You probably know this by now, SM is a tool that you can leverage to get in front of the right customers. Start posting on a regular basis but be careful not to alienate your readers with overzealous posts promoting products. I recommend people use the 8 + 2 rule. You provide 8 pieces of useful content, regardless if it’s on your site or not. Content like tutorials, tips and tricks, peer reviews, etc. Don’t be afraid to test the water with this strategy, find out what your users like and with that type of content they interact and start sharing. This will be your bread and butter for the next few months. It’s crucial to have a blog where you can share your experiences and knowledge with your peers. As part of the content marketing efforts, you’ll have to do guest posts. Find like minded people who own blogs and start pitching ideas for guest posts. Most blog owners are fairly easy to reach and communicate with so I highly advise you do this. Guest blogging on small blogs is a great way to reach new audiences but perhaps even better than that would be to go on Medium.com. It’s a great platform to publish content, with a ton of viewers, so I’d strongly suggest you try it out. So if my math is correct after getting set up with your website domain and host you’d be left with $30 to $40. I’d advise you drop a few dollars in Facebook ads. It’s easy to do, you don’t need to spend money on a consultant and Facebook has a bunch of tutorials on this. What I’d suggest you do is select the best products you have in your store and create a carousel. Have at least 4 products in there. Select a small audience with the demographic that fits your niche and place a $5 limit on the ad spending. You’ll have around a week to tweak the ad and if you have the right combination of audience and product, chances are you’ll have made your first sell by now. If you do the math, going with a self-hosted solution will cost around $50 to host ( for a 5 or 6 month period), add to that $ 10 for the domain and you get to $ 60. You’ll have to host it yourself, do all the maintenance and configuration but you get to have about 6 months to make up your investment. Going with a SaaS will cost around $60 but you will be done and ready to go in a couple of days which is great if you don’t want to spend time learning to code or set up a CMS. The downside here is that your $50 will cover only that first month which adds to the pressure of making a few sells (which shouldn’t be a problem). 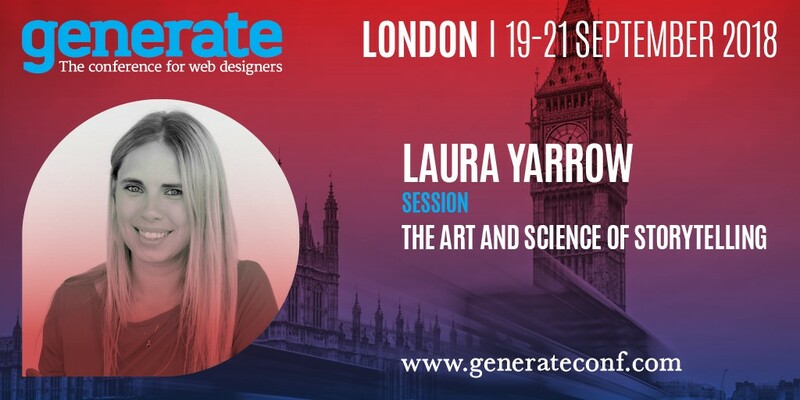 With less than three weeks to the opening of Generate London 2018, preparations for the season’s premier web design conference are really gathering pace. Not only did the Generate flash sale exceed our expectations earlier in the month, but we’ve also been hard at work behind the scenes finalising our roster of top web design and dev speakers for you. But don’t just take our word for it: here’s just a tiny taste to whet your appetites. 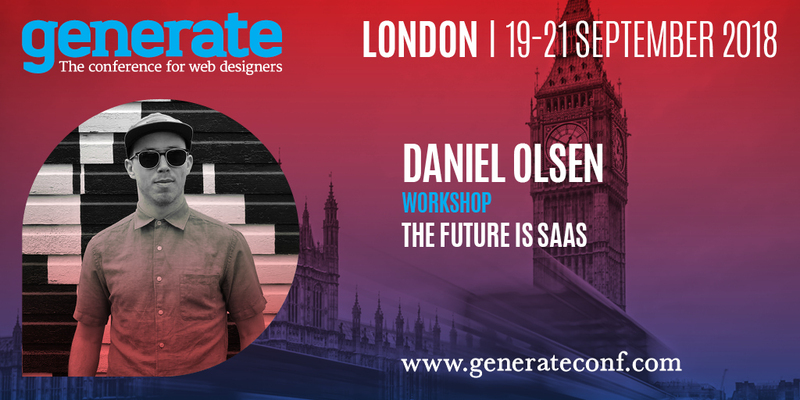 As chief operating officer of DigitalCube, Daniel Olson’s responsibilities include product development and growth: he focuses on creating technical solutions centred around WordPress, design thinking and the point those two things intersect. And this experience undoubtedly inspired his talk at Generate: The Future is SaaS. While the upper limit of what&apos;s possible in a digital service-based industry may not exist, the reality of designing a product for scale may have real-world implications for its users and the communities around them. This is why his talk will explore its effect on relationships, quality of life, freedom of choice and what the future of the as-a-service model has in store. Laura Yarrow is a UX consultant at Experience UX. She’s spent 12 years in the digital industry, first as a web developer and subsequently as a user experience designer, and her passions are ethnographic and field research, behavioural psychology and understanding people. As a result she is fascinated by what happens when we tell stories. 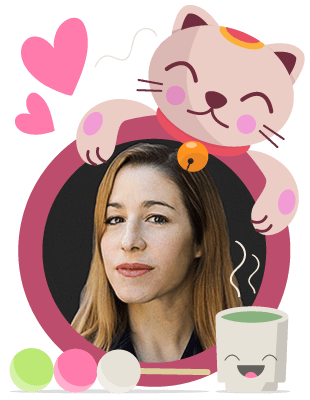 In her talk, The Art and Science of Storytelling, Yarrow will be speaking about how understanding the neuroscience and psychology of storytelling can be used to create engaging, learnable and memorable experiences for your products and services. 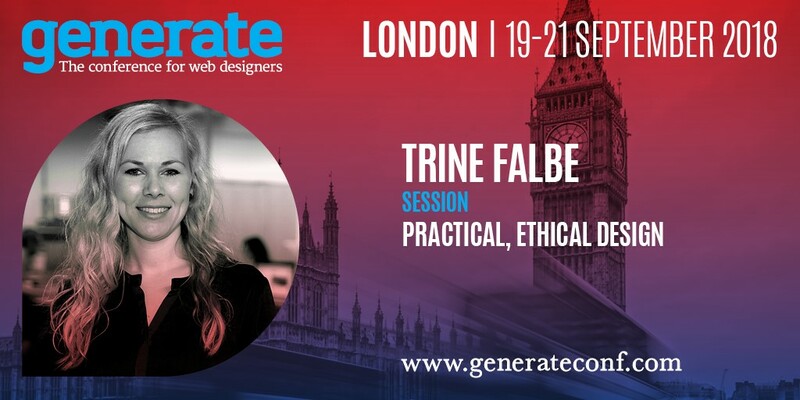 Trine Falbe is a consultant, researcher, speaker and lecturer who empowers people using design. She is the author of the book White Hat UX and is deeply committed to putting humans at the centre of work and building honest, transparent experiences. And there is certainly a lot of discussion about ethical design these days. About evil, Silicon Valley surveillance capitalists like Google and Facebook who track, profile and exploit our data. But the discussion can seem distanced to the developer or designer who is simply trying to make a living. How are we supposed to take up the fight against unethical design? By asking the right questions and by working within a White Hat framework, both of which you’ll get to know in Falbe&apos;s talk: Practical, Ethical Design. Chief enchantment officer at Wizardry Ltd, Tony Harmer (aka The Design Ninja) is an illustrator, designer and learning-content author who has helped some of the world’s largest brands identify workflow cost savings running into the tens of millions and frustration savings that are priceless. As an Adobe Certified Expert and Instructor in many applications, Harmer has specialised in interoperability with Creative Cloud and is very enthusiastic about the accelerating of desktop production on the desktop through the integration of integration of mobile tools into design workflows. 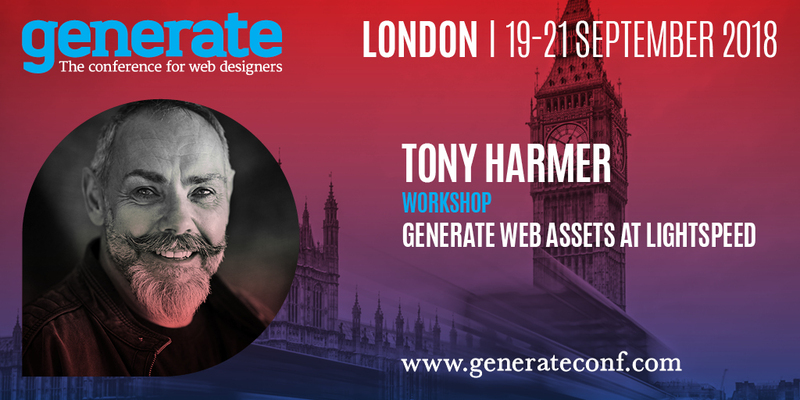 Harmer’s talk, Generate Web Assets at Lightspeed, will look at the production of graphic assets in today&apos;s "more and faster, for less" world and shows a stack of workflow efficiencies that will save time and money. With Generate only a few short weeks away, there isn’t a whole lot of time left to secure your place. See the full list of speakers here and make sure you pick up your ticket today! The post 7 New Trends in Graphic Design for 2018 appeared first on designrfix.com. A list of all the essential presentation and business-related apps for iPad. (This article is kindly sponsored by Adobe.) 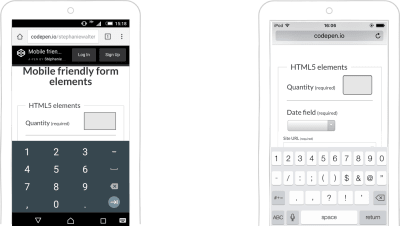 Forms are the linchpin of all mobile interactions; it stands between the person and what they’re looking for. Every day, we use forms for essential online activities. Recall the last time you bought a ticket, booked a hotel room or made a purchase online — most probably those interactions contained a step with filling out a form. Forms are just a means to an end. Users should be able to complete them quickly and without confusion. In this article, you’ll learn practical techniques that will help you design an effective form. These include text fields, password fields, checkboxes, radio buttons, sliders and any other fields designed for user input. These tell users what the corresponding input fields mean. This includes the order of fields, the form’s appearance on the page, and the logical connections between different fields. The form will have at least one call to action (the button that triggers data submission). Feedback notifies the user about the result of an operation. Feedback can be positive (for example, indicating that the form was submitted successfully) or negative (saying something like, “The number you’ve provided is incorrect”). This article covers many aspects related to structure, input fields, labels, action buttons and validation. Most points mentioned in this article have visual do and don’t examples; all such examples were created using Adobe XD. 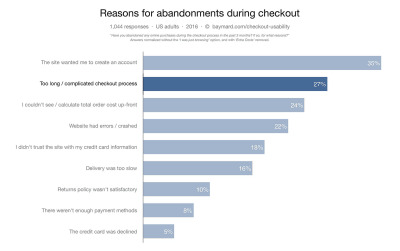 Baymard Institute analyzed checkout forms and found that a too long or too complicated checkout process is one of the top reasons for abandonment during checkout. The study found that the average checkout contains almost 15 form fields. Most online services could reduce the number of fields displayed by default by 20 to 60%. Many designers are familiar with the “less is more” rule; still, they ask additional questions in an attempt to gather more data about their users. It might be tempting to collect more data about your users during the initial signup, but resist that temptation. Think about it this way: With every additional field you add to your form, you increase the chance of losing a prospective user. Is the information you gain from a field worth losing new users? Remember that, as long as you’ve collected a user’s contact information, you can always follow up with a request for more data. Before optimizing optional fields, ask yourself whether you really need to include them in your form. Think about what information you really need, not what you want. Ideally, the number of optional fields in your form should be zero. Mark optional fields instead of mandatory ones. If you ask as little as possible, then the vast majority of fields in your form will be mandatory. Therefore, mark only those fields in the minority. For instance, if five out of six fields are mandatory, then it makes sense to mark only one field as optional. Use the “Optional” label to denote optional fields. Avoid using the asterisk (*) to mean “optional.” Not all users will associate the asterisk with optional information, and some users will be confused by the meaning (an asterisk is often used to denote mandatory fields). When possible, use field length as an affordance. The length of an input field should be in proportion to the amount of information expected in the field. The size of the field will act as a visual constraint — the user will know how much text is expected to be entered just by looking at the field. Generally, fields such as ones for area codes and house numbers should be shorter than ones for street addresses. Auto-focus the first input field in your form. Auto-focusing a field gives the user an indication and a starting point, so that they are able to quickly start filling out the form. By doing that, you reduce the interaction cost — saving the user one unnecessary tap. Make the active input field prominent and focused. The field focus itself should be crystal clear — users should be able to understand at a glance where the focus is. It could be an accented border color or a fade-in of the box. 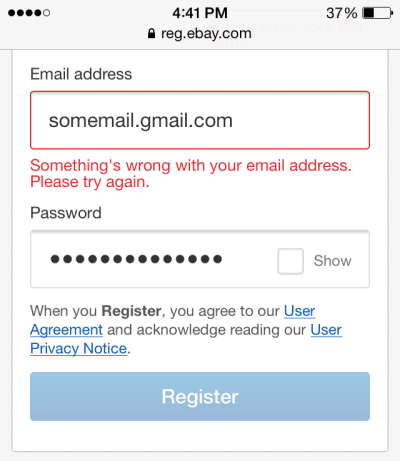 The reason why an extra field for the email address is so popular among product developers is apparent: Every company wants to minimize the risk of hard bounces (non-deliverables caused by invalid email addresses). Unfortunately, following this approach doesn’t guarantee that you’ll get a valid address. Users often copy and paste their address from one field to another. Instead of duplicating the password field, provide an option that allows users to view the password they have chosen to create. Have an icon or checkbox that unmasks the password when clicked. A password preview can be an opportunity for users to check their data before sending. Do not slice fields when asking for a full name, phone number or date of birth. Sliced fields force the user to make additional taps to move to the next field. 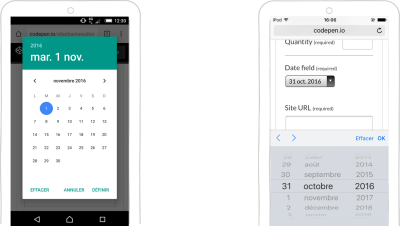 For fields that require some formatting (such as phone numbers or a date of birth), it’s also better to have a single field paired with clear formatting rules as its placeholder. Luke Wroblewski famously said that dropdowns should be the UI of last resort. 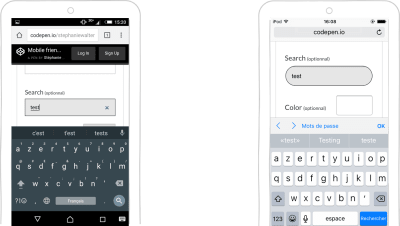 Dropdowns are especially bad for mobile because collapsed elements make the process of data input harder on a small screen: Placing options in a dropdown requires two taps and hides the options. If you’re using a dropdown for selection of options, consider replacing it with radio buttons. They will make all options glanceable and also reduce the interaction cost — users can tap on the item and select at once. Formatting uncertainty is one of the most significant problems of form design. 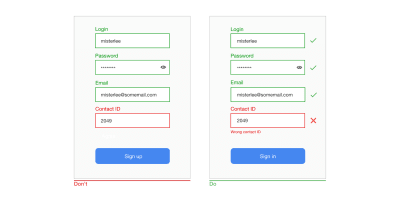 This problem has a direct connection with form abandonment — when users are uncertain of the format in which they should provide data, they can quickly abandon the form. There are a few things you can do to make the format clear. The text in an input field can tell users what content is expected. Placeholder text is not required for simple fields such as “Full name”, but it can be extremely valuable for fields that require data in a specific format. For example, if you design search functionality for tracking a parcel, it would be good to provide a sample tracking number as a placeholder for the tracking-number field. It’s vital that your form should have a clear visual distinction between the placeholder text and the actual value entered by the user. In other words, placeholder text shouldn’t look like a preset value. Without clear visual distinction, users might think that the fields with placeholders already have values. Field masking is a technique that helps users format inputted text. Many designers confuse field masking with placeholder text — they are not the same thing. Unlike placeholders, which are basically static text, masks automatically format the data provided by the user. In the example below, the parentheses, spaces and dashes appear on the screen automatically as a phone number is entered. Masked input also makes it easy for users to validate information. When a phone number is displayed in chunks, it makes it easier to find and correct a typo. Mobile users appreciate apps and websites that provide an appropriate keyboard for the field. This feature prevents them from doing additional actions. 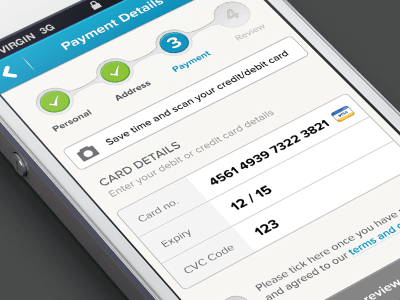 For example, when users need to enter a credit card number, your app should only display the dialpad. It’s essential to implement keyboard matching consistently throughout the app (all forms in your app should have this feature). input type=”text” displays the mobile device’s normal keyboard. input type=”email” displays the normal keyboard and ‘@’ and ‘.com’. input type=”tel” displays the numeric 0 to 9 keypad. input type=”number” displays a keyboard with numbers and symbols. 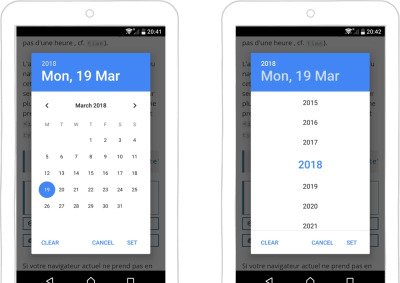 input type=”date” displays the mobile device’s date selector. input type=”datetime” displays the mobile device’s date and time selector. input type=”month” displays the mobile device’s month and year selector. Many forms ask users to provide a range of values (for example, a price range, distance range, etc.). Instead of using two separate fields, “from” and “to”, for that purpose, use a slider to allow users to specify the range with a thumb interaction. People are increasingly concerned about privacy and information security. When users see a request for information they consider as private, they might think, “Hm, why do they need this?” If your form asks users for sensitive information, make sure to explain why you need it. You can do that by adding support text below relevant fields. As a rule of thumb, the explanation text shouldn’t exceed 100 characters. Unlike smart defaults, which are calculated by the system based on the information the system has about users, static defaults are preset values in forms that are the same for all users. Avoid static defaults unless you believe a significant portion of your users (say, 95%) would select those values — particularly for required fields. Why? Because you’re likely to introduce errors — people scan forms quickly, and they won’t spend extra time parsing all of the questions; instead, they’ll simply skip the field, assuming it already has a value. Jef Raskin once said, “The system should treat all user input as sacred.” This is absolutely true for forms. It’s great when you start filling in a web form and then accidentally refresh the page but the data remains in the fields. Tools such as Garlic.js help you to persist a form’s values locally until the form is submitted. This way, users won’t lose any precious data if they accidentally close the tab or browser. If you want to make the process of data input as smooth as possible, it’s not enough to minimize the number of input fields — you should also pay attention to the user effort required for the data input. Typing has a high interaction cost — it’s error-prone and time-consuming, even with a physical keyboard. But when it comes to mobile screens, it becomes even more critical. More typing increases the user’s chance of making errors. Strive to prevent unnecessary typing, because it will improve user satisfaction and decrease error rates. Most users experience autocompletion when typing a question in Google’s search box. Google provides users with a list of suggestions related to what the user has typed in the field. The same mechanism can be applied to form design. For example, a form could autocomplete an email address. Autocapitalizing makes the first letter a capital automatically. This feature is excellent for fields like names and street addresses, but avoid it for password fields. Autocorrection modifies words that appear to be misspelled. Turn this feature off for unique fields, such as names, addresses, etc. Typing an address is often the most cumbersome part of any online signup form. Make this task easier by using the browser function to fill the field based on previously entered values. According to Google’s research, auto-filling helps people fill out forms 30% faster. Modern mobile devices are sophisticated devices that have a ton of amazing capabilities. Designers can use a device’s native features (such as camera or geolocation) to streamline the task of inputting data. Below are just a few tips on how to make use of sensors and device hardware. It’s possible to preselect the user’s country based on their geolocation data. But sometimes prefilling a full address can be problematic due to accuracy issues. Google’s Places API can help solve this problem. It uses both geolocation and address prefilling to provide accurate suggestions based on the user’s exact location. Using location services, it’s also possible to provide smart defaults. For example, for a “Find a flight” form, it’s possible to prefill the “From” field with the nearest airport to the user based on the user’s geolocation. The biggest problem of using a text password today is that most people forget passwords. 82% of people can’t remember their passwords, and 5 to 10% of sessions require users to reset a password. 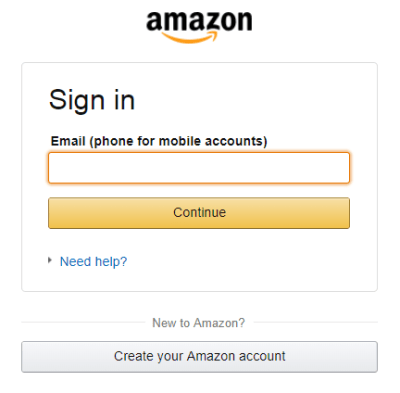 Password recovery is a big deal in e-commerce. 75% of users wouldn’t complete a purchase if they had to attempt to recover their password while checking out. The future of passwords is no passwords. Even today, mobile developers can take advantage of biometric technologies. Users shouldn’t need to type a password; they should be able to use biometric readers for authentication — signing in using a fingerprint or face scanning. If your form asks users to provide credit card details or information from their driver’s license, it’s possible to simplify the process of data input by using the camera as a scanner. Provide an option to take a photo of the card and fill out all details automatically. But remember that no matter how good your app fills out the fields, it’s essential to leave them available for editing. Users should be able to modify the fields whenever they want. Voice-controlled devices, such as Apple HomePod, Google Home and Amazon Echo, are actively encroaching on the market. The number of people who prefer to use voice for common operations has grown significantly. According to ComScore, 50% of all searches will be voice searches by 2020. As users get more comfortable and confident using voice commands, they will become an expected feature of mobile interactions. Voice input provides a lot of advantages for mobile users — it’s especially valuable in situations when users can’t focus on a screen, for example, while driving a car. 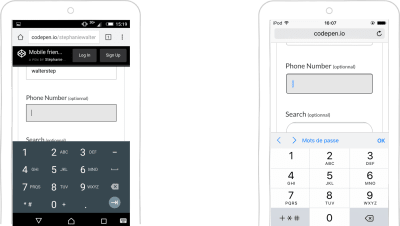 When designing a form, you can provide voice input as an alternative method of data input. The label is the text that tells users what data is expected from them in a particular input field. 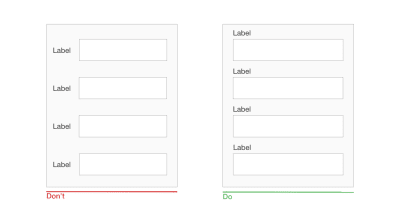 Writing clear labels is one of the best ways to make a form more accessible. Labels should help the user understand what information is required at a glance. Avoid using complete sentences to explain. A label is not help text. 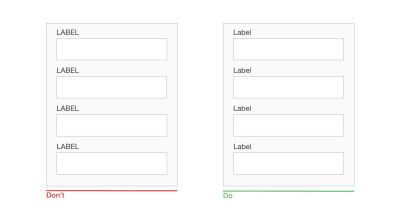 Write succinct and crisp labels (a word or two), so that users can quickly scan your form. Put each label close to the input field, because the eye will visually know they’re tied together. While inline labels look good and save valuable screen estate, these benefits are far outweighed by the significant usability drawbacks, the most critical of which is the loss of context. When users start entering text in a field, the placeholder text disappears and forces people to recall this information. While it might not be a problem for simple two-field forms, it could be a big deal for forms that have a lot of fields (say, 7 to 10). It would be tough for users to recall all field labels after inputting data. Not surprisingly, user testing continually shows that placeholders in form fields often hurt usability more than help. There’s a simple solution to the problem of disappearing placeholders: the floating (or adaptive) label. After the user taps on the field with the label placeholder, the label doesn’t disappear, it moves up to the top of the field and makes room for the user to enter their data. 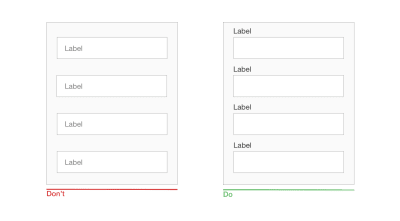 Putting field labels above the fields in a form improves the way users scan the form. Using eye-tracking technology for this, Google showed that users need fewer fixations, less fixation time and fewer saccades before submitting a form. Another important advantage of top-aligned labels is that they provide more space for labels. Long labels and localized versions will fit more easily in the layout. The latter is especially suitable for small mobile screens. 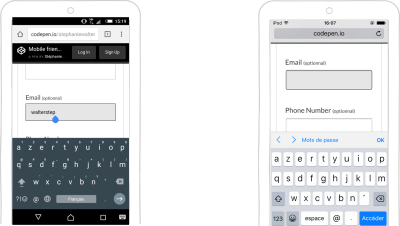 You can have form fields extend the full width of the screen, making them large enough to display the user’s entire input. Using sentence case for labels has one advantage over title case: It is slightly easier (and, thus, faster) to read. While the difference for short labels is negligible (there’s not much difference between “Full Name” and “Full name”), for longer labels, sentence case is better. Now You Know How Difficult It Is to Read Long Text in Title Case. All-caps text — meaning text with all of the letters cap­i­tal­ized — is OK in contexts that don’t involve substantive reading (such as acronyms and logos), but avoid all caps otherwise. As mentioned by Miles Tinker in his work Legibility of Print, all-capital print dramatically slows the speed of scanning and reading compared to lowercase type. You know by now that users scan web pages, rather than read them. The same goes for filling out forms. That’s why designers should design a form that is easy to scan. Allowing for efficient, effective scanning is crucial to making the process of the filling out a form as quick as possible. A study by CXL Institute found that single-column forms are faster to complete than multi-column forms. In that study, test participants were able to complete a single-column form an average of 15.4 seconds faster than a multi-column form. In a one-column design, the eyes move in a natural direction, from top to bottom, one line at a time. This helps to set a clear path for the user. One column is excellent for mobile because the screens are longer vertically, and vertical scrolling is a natural motion for mobile users. There are some exceptions to this rule. It’s possible to place short and logically related fields on the same row (such as for the city and area code). The way you ask questions also matters. Questions should be asked logically from the user’s perspective, not according to the application or database’s logic, because it will help to create a sense of conversation with the user. For example, if you design a checkout form and asks for details such as full name, phone number and credit card, the first question should be for the full name. Changing the order (for example, starting with a phone number instead of a name) leads to discomfort. In real-world conversations, it would be unusual to ask for someone’s phone number before asking their name. When it comes to designing a flow for questions you want to ask, think about prioritization. Follow the rule “easy before difficult” and place in-depth or personal questions last. This eases users into the process; they will be more likely to answer complex and more intrusive questions once they’ve established a rapport. This has a scientific basis: Robert Cialdini’s principle of consistency stipulates that when someone takes a small action or step towards something, they feel more compelled to finish. One of the principles of Gestalt psychology, the principle of proximity, states that related elements should be near each other. This principle can be applied to the order of questions in a form. The more related questions are, the closer they should be to each other. Designers can group related fields into sections. If your form has more than six questions, group related questions into logical sections. Don’t forget to provide a good amount of white space between sections to distinguish them visually. How do you design a form that asks users a lot of questions? Of course, you could put all of the questions on one screen. But this hinder your completion rate. If users don’t have enough motivation to complete a form, the form’s complexity could scare them away. The first impression plays a vital role. 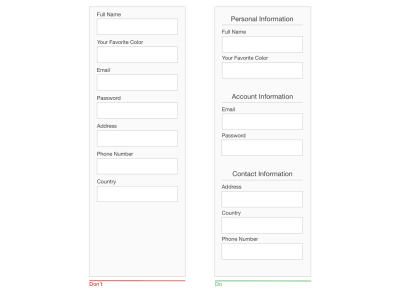 Generally, the longer or more complicated a form seems, the less likely users will be to start filling in the blanks. Minimize the number of fields visible at one time. This creates the perception that the form is shorter than it really is. There are two techniques to do this. Initially, show users only a few of the most important options. Reveal parts of your form as the user interacts with it. Chunking entails breaking a long form into steps. It’s possible to increase the completion rate by splitting a form into a few steps. Chunking can also help users process, understand and remember information. When designing multi-step forms, always inform users of their progress with a completeness meter. Designers can use either a progress tracker (as shown in the example above) or a “Step # out of #” indicator both to tell how many steps there are total and to show how far along the user is at the moment. The latter approach could be great for mobile forms because step indication doesn’t take up much space. A button is an interactive element that direct users to take an action. A button’s label should explain what the button does; users should be able to understand what happens after a tap just by looking at the button. Avoid generic labels such as “Submit” and “Send”, using instead labels that describe the action. Clear or reset buttons allow users to erase their data in a form. These buttons almost never help users and often hurt them. The risk of deleting all of the information a user has entered outweighs the small benefit of having to start again. If a user fills in a form and accidentally hits the wrong button, there’s a good chance they won’t start over. Avoid secondary actions if possible. 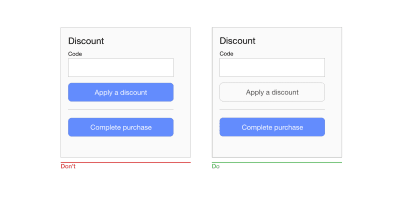 But if your form has two calls to action (for example, an e-commerce form that has “Apply discount” and “Submit order”) buttons, ensure a clear visual distinction between the primary and secondary actions. Visually prioritize the primary action by adding more visual weight to the button. This will prevent users from tapping on the wrong button. Tiny touch targets create a horrible user experience because they make it challenging for users to interact with interactive objects. It’s vital to design finger-friendly touch targets: bigger input fields and buttons. The image below shows that the width of the average adult finger is about 11 mm. According to material design guidelines, touch targets should be at least 48 × 48 DP. A touch target of this size results in a physical size of about 9 mm, regardless of screen size. It might be appropriate to use larger touch targets to accommodate a wider spectrum of users. Not only is target size important, but sufficient space between touch targets matters, too. The main reason to maintain a safe distance between touch targets is to prevent users from touching the wrong button and invoking the wrong action. The distance between buttons becomes extremely important when binary choices such as “Agree” and “Disagree” are located right next to each other. Material design guidelines recommend separating touch targets with 8 DP of space or more, which will create balanced information density and usability. Forms actions commonly require some time to be processed. For example, data calculation might be required after a submission. It’s essential not only to provide feedback when an action is in progress, but also to disable the submit button to prevent users from accidentally tapping the button again. This is especially important for e-commerce websites and apps. By disabling the button, you not only prevent duplicate submissions, which can happen by accident, but you also provide a valuable acknowledgment to users (users will know that the system has received their submission). Upon successful completion of a form, it’s critical to notify users about that. It’s possible to provide this information in the context of an existing form (for example, showing a green checkmark above the refreshed form) or to direct users to a new page that communicates that their submission has been successful. Users will make mistakes. It’s inevitable. It’s essential to design a user interface that supports users in those moments of failures. 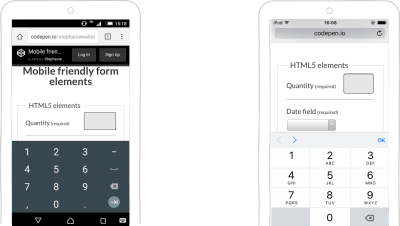 While the topic of errors and validation deserves its own article, it’s still worth mentioning a few things that should be done to improve the user experience of mobile forms. Prevention is better than a cure. If you’re a seasoned designer, you should be familiar with the most common cases that can lead to an error state (error-prone conditions). For example, it’s usually hard to correctly fill out a form on the first attempt, or to properly sync data when the mobile device has a poor network connection. Take these cases into account to minimize the possibility of errors. In other words, it’s better to prevent users from making errors in the first place by utilizing constraints and offering suggestions. For instance, if you design a form that allows people to search for a hotel reservation, you should prevent users from selecting check-in dates that are in the past. 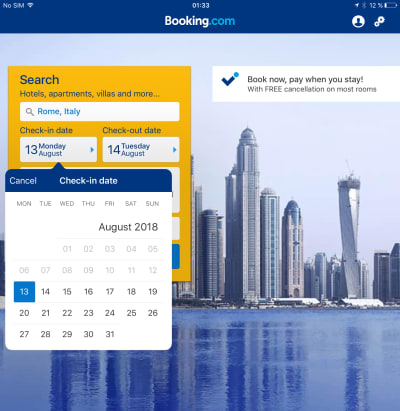 As shown in the Booking.com example below, you can simply use a date selector that allows users only to choose today’s date or a date in the future. Such a selector would force users to pick a date range that fits. While there might be cases where it’s essential to use strict validation rules, in most cases, strict validation is a sign of lazy programming. Showing errors on the screen when the user provides data in a slightly different format than expected creates unnecessary friction. And this would have a negative impact on conversions. Avoid vague or general error messages. Messages like “Something went wrong. Please, try again later” don’t say much to users. Users will wonder what exactly went wrong. Always try to explain the root cause of a problem. Make sure users know how to fix errors. Error messages like “User input error: 0x100999” are cryptic and scary. Write like a human, not like a robot. Use human language, and explain what exactly the user or system did wrong, and what exactly the user should do to fix the problem. 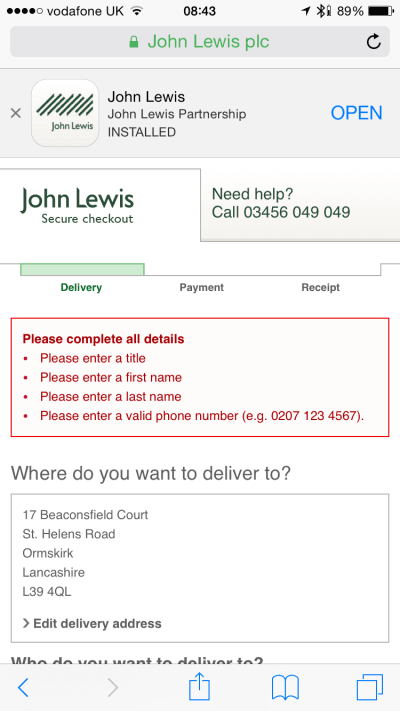 When it comes to displaying error messages, designers opt for one of two locations: at the top of the form or inline. The first option can make for a bad experience. Javier Bargas-Avila and Glenn Oberholzer conducted research on online form validation and discovered that displaying all error messages at the top of the form puts a high cognitive load on user memory. Users need to spend extra time matching error messages with the fields that require attention. It’s much better to position error messages inline. First, this placement corresponds with the user’s natural top-to-bottom reading flow. Secondly, the errors will appear in the context of the user’s input. The time at which you choose to display an error message is vital. Seeing an error message only after pressing the submit button might frustrate users. Don’t wait until users finish the form; provide feedback as data is being entered. 47% decrease in the number of eye fixations. Avoid showing inline validation on focus. In this case, as soon as the user taps a field, they see an error message. The error appears even when the field is completely empty. When an error message is shown on focus, it might look like the form is yelling at the user before they’ve even started filling it out. Don’t validate after each character typed. This approach not only increases the number of unnecessary validation attempts, but it also frustrates users (because users will likely see error messages before they have completed the field). Ideally, inline validation messages should appear around 500 to 1000 milliseconds after the user has stopped typing or after they’ve moved to the next field. This rule has a few exceptions: It’s helpful to validate inline as the user is typing when creating a password (to check whether the password meets complexity requirements), when creating a user name (to check whether a name is available) and when typing a message with a character limit. Users of all abilities should be able to access and enjoy digital products. Designers should strive to incorporate accessibility needs as much as they can when building a product. Here are a few things you can do to make your forms more accessible. Small text should have a contrast ratio of at least 4.5:1 against its background. Large text (at 14-point bold, 18-point regular and up) should have a contrast ratio of at least 3:1 against its background. Measuring color contrast can seem overwhelming. Fortunately, some tools make the process simple. One of them is Web AIM Color Contrast Checker, which helps designers to measure contrast levels. Color blindness (or color vision deficiency) affects approximately 1 in 12 men (8%) and 1 in 200 women in the world. While there are many types of color blindness, the most common two are protanomaly, or reduced sensitivity to red light, and deuteranomaly, or reduced sensitivity to green light. When displaying validation errors or success messages, don’t rely on color alone to communicate the status (i.e. by making input fields green or red). As the W3C guidelines state, color shouldn’t be used as the only visual means of conveying information, indicating an action, prompting a response or distinguishing a visual element. Designers should use color to highlight or complement what is already visible. Support colorblind people by providing additional visual cues that help them understand the user interface. Allow users to increase font size to improve readability. 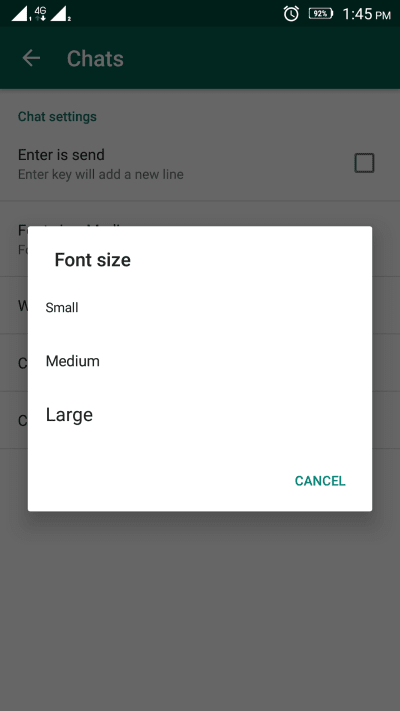 Mobile devices and browsers include features to enable users to adjust the font size system-wide. Also, make sure that your form has allotted enough space for large font sizes. All points mentioned above can be considered as industry best practices. But just because something is called a “best practice” doesn’t mean it is always the optimal solution for your form. Apps and websites largely depend on the context in which they are used. Thus, it’s always essential to test your design decisions; make sure that the process of filling out a form is smooth, that the flow is not disrupted and that users can solve any problems they face along the way. Conduct usability testing sessions on a regular basis, collect all valuable data about user interactions, and learn from it. Users can be hesitant to fill out forms. So, our goal as designers is to make the process of filling out a form as easy as possible. When designing a form, strive to create fast and frictionless interactions. Sometimes a minor change — such as properly writing an error message — can significantly increase the form’s usability. his article is part of the UX design series sponsored by Adobe. 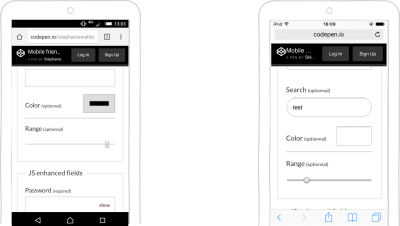 Adobe XD tool is made for a fast and fluid UX design process, as it lets you go from idea to prototype faster. Design, prototype and share — all in one app. You can check out more inspiring projects created with Adobe XD on Behance, and also sign up for the Adobe experience design newsletter to stay updated and informed on the latest trends and insights for UX/UI design. It can be frustrating to work with a web design client who doesn’t provide direction or makes vague requests. This lack of communication can result in tons of revisions and difficulty. Often, this is because they simply don’t know the design process. The client usually does know what they want, they just aren’t sure how to ask for it. So, before you do 50 revisions (and tear your hair out), try asking the right questions and drawing out their vision for the project. Before you even begin working, you should already have down the most essential ideas. Consider using a survey or questionnaire to establish these basics if you’re having trouble. Do you have any branding or style guidelines? What do you definitely want to include and avoid? Do you have a color palette in mind? What’s the overall style? Who’s your target audience? What functions does this site need to include (shopping cart, contact forms, navigation bar, SSL certificate and other security features)? If you can’t extract this from your clients, your project will stall. What’s the purpose of this webpage/website? What are your goals? What kind of people do you want to visit this website? Every website and webpage is designed around a central goal. Is it to read the blog? Share something? Click a link, buy a product? This is what your client wants emphasized. Ask them what they want people who visit this website to do. Also important is the target visitor. It’s difficult to design a website when you don’t know your audience. Ask them to describe a “user persona” that represents the ideal visitor or customer. Why do you want a new website? What is your old website not doing right? When it’s time to do a redesign, this is the most important question. Maybe your client wants to stay trendy, update the color scheme, or implement stylish navigation. Whatever the case, you know what the goal is in this redesign. Nothing teaches better than an example. Many clients will describe things ambiguously. For instance, asking for “sparkles” and not elaborating. Where? A few or a bunch? Should they be subtle or eye-grabbing? If you get an indecisive reply, ask them to find examples of what they want. Or find them yourself and ask them to pick a favorite. Which of these options do you like more? It’s more work, but presenting a client with 2-3 options with small differences can be a great help. You can get an idea of what they want without them having to tell you directly. This also means less revisions and more chance for them to point out features they like or dislike. What do you love most about this design? What do you dislike about it? This is a great question because it takes a champion to give you an unhelpful answer. Clients are forced to point out something they enjoy or aren’t partial to. Even if the answer is short, it’s still extremely valuable feedback. At the risk of sounding like a curious toddler, sometimes “why” is the best question you can ask. It needs to be phrased carefully in order to not come off as curt or accusatory, but the answer is exactly what you’re after. Why do you want that section there? Why do you feel it isn’t colorful enough, what do you have in mind? Why that typography? Why do you dislike the other font? Obviously, you shouldn’t question every decision your client makes, but it can help you understand their mindset and goals. A general tip: avoid vague questions, especially ones that can generate one-word answers. Instead, opt for open-ended questions that force clients to explain themselves, or specific questions about certain elements. Sometimes, you just have to keep asking questions until you get a satisfactory answer. If you’re a web design client struggling with this, ask yourself these questions! Try to be specific about what you like and dislike. Look at other websites; point out what you like and why. If you give concrete feedback, the work will get done quicker, there will be less revisions, and everyone will be happier!